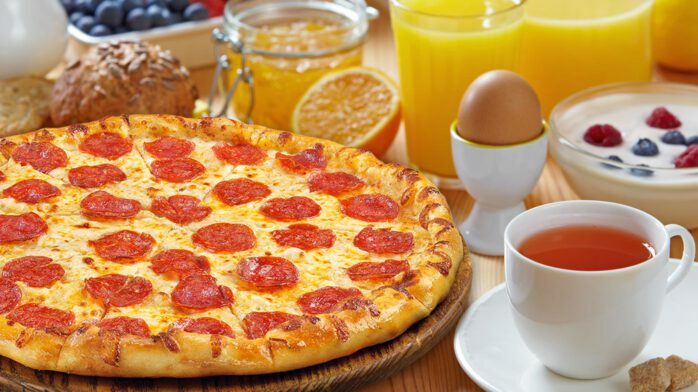 Eating pizza for breakfast could be better for you than cereal, says science, or to be more specific, Registered Dietitian Nutritionist Chelsey Amer. Now before you get too excited, pizza still isn’t healthy to eat for breakfast, but we’ve made some progress. Not all pizza is created equal — nor is all breakfast cereal — but if you’re comparing a bowl filled with sugar flakes and whole milk to a slice of garlic and onion pizza on a thin, whole wheat crust, then the pizza is definitely going to be the healthier of the two choices. So go ahead and have that slice of pizza for breakfast. It’s delicious and nutritious. Well, a little more nutritious than that bowl of sugar flakes… and a lot more delicious.